Lux Mentis Booksellers represents Tim Ely’s Manuscript Books. Ian Kahn and team have a sizable current inventory, access to additional completed books and original prints from the “Impossible Landscape” series. Lux Mentis can be found at https://www.luxmentis.com or followed on Instagram at LuxMentis. Other works may be obtained directly from Tim Ely. The easiest way to initiate contact is with the form at the bottom of this page. The ORION folio from SCORE. 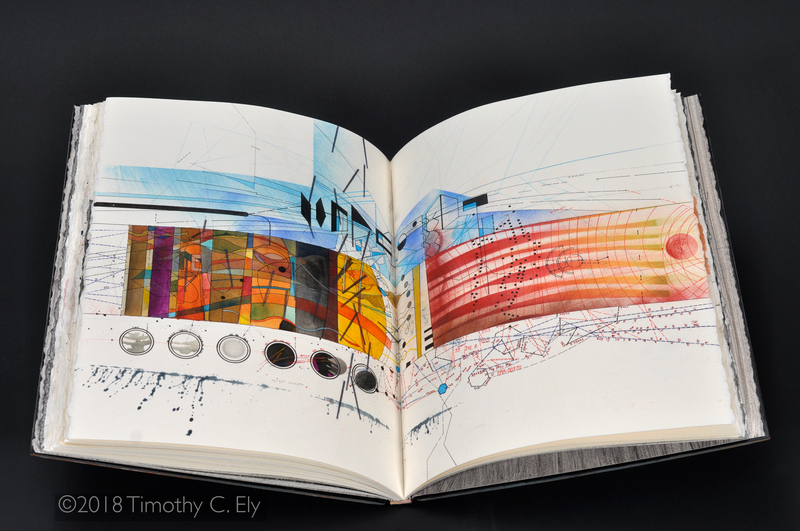 Newly available are reproduction prints of each folio in SCORE as well as a CD of Larry Ellison’s pieces. SCORE is a manuscript book now in the Lilly Library at Indiana University. Also available are reproduction prints of each folio in INSECTORIUM which is another manuscript book which resides in the Lilly Library. Sewing a book on a Dreadnought-sized sewing frame. The studio also has bookbinding equipment and miscellany available for purchase. Soon we will have a page of images of various things that are available. A published catalog, Timothy C. Ely: 8 Books, with recent work is available through Amazon.com. Ely is available for lectures, workshops off site and private instruction. Each summer he also holds a series of workshops on Sketchbooks, making, ramifications and image making. Enquire below if interested.